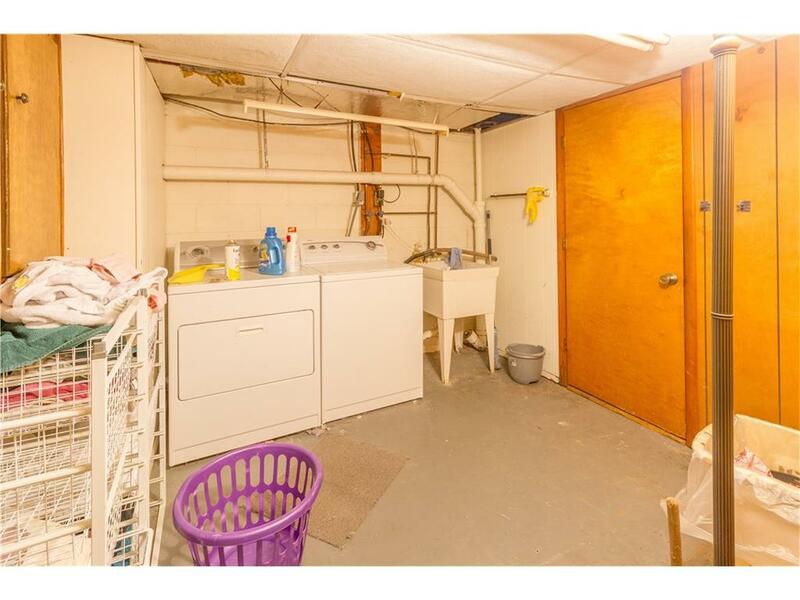 If I had to choose the scariest room of all of Flip 4, I would choose the laundry room/half bathroom…without a doubt. It looked like a scene straight out of Psycho. It was a dungeon. Dirty floors. Low ceilings. The toilet was missing. The sink was missing. It had no light except for a plug-in lamp. Before I could start with the pretty stuff in the room, the electrical needed a lot of attention. My electrician spent an entire weekend making the room safe. We also had to address a leaking washing machine faucet and updated the exposed utility sink plumbing. None of it was “pretty” but all of it was necessary! Once all of the safety issues were addressed, it was time to work on beautifying it. And I’ll be honest. This room gave me a run for my money. It’s a dungeon with no natural light (and in its current state, no overhead light either!). It was two rooms in one and connected to the garage, so a lot was stacked against this little room! But as I’ve said a million times before, oh the magic of paint! 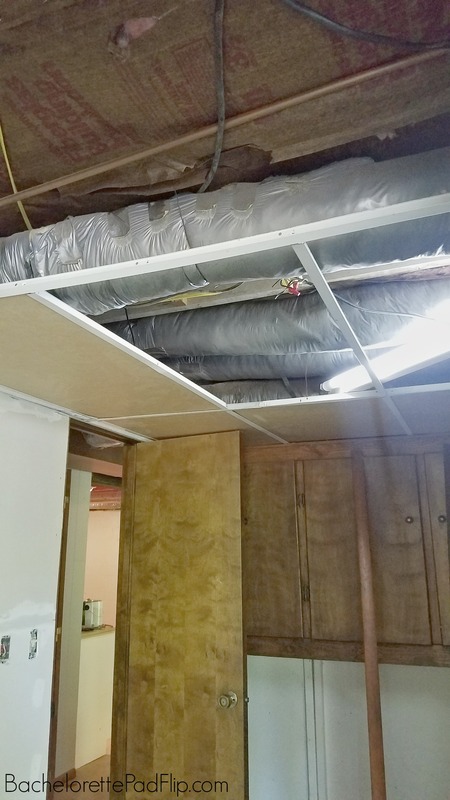 The original grid ceiling wasn’t complete, and we had hope to drywall it. 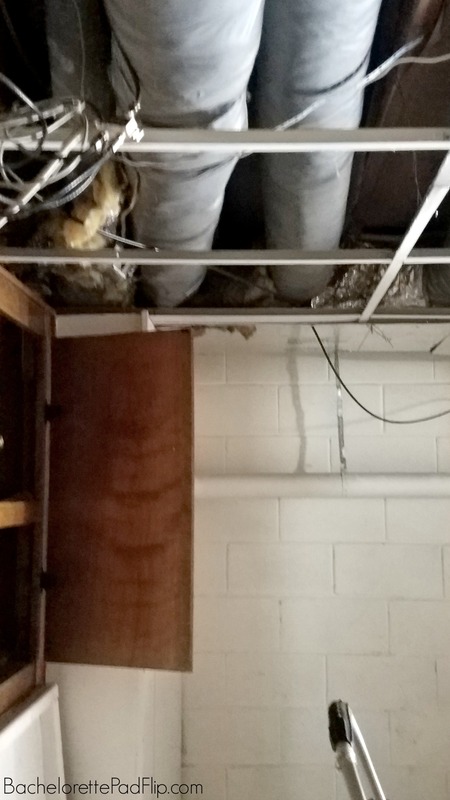 But the margin between the door and ceiling was so extremely tight, it wouldn’t have fit sheetrock. So, back to the drawing board. And that’s where my painter had a genius idea. We had some leftover scrap paneling from a project I attempted (and failed), so he cut it up and used it as tiles for the grid. 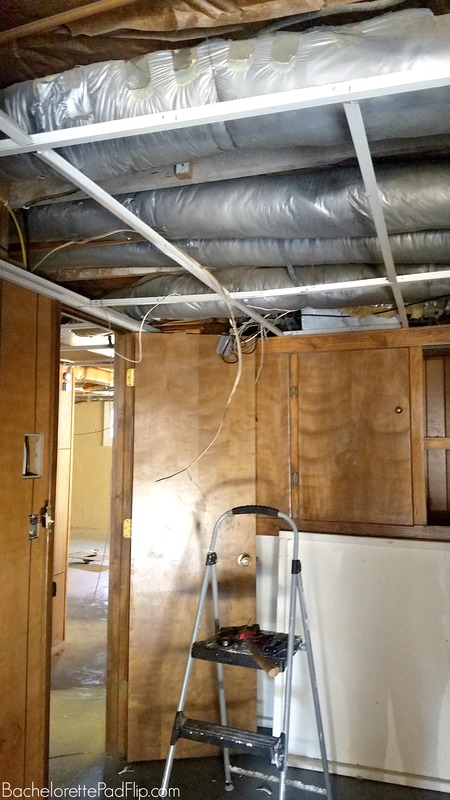 We also tore off the original paneling on the walls and drywalled those. Just getting the decaying paneling replaced helped so much in modernizing the room! From there, it was time to get to work! As with many of my projects, I was out of money. So I had to get creative! We actually tried to lay the same flooring we used upstairs in this room, but the glue just wouldn’t dry for some reason. So we ripped it up, scraped and cleaned the concrete, and opted to paint the floors. 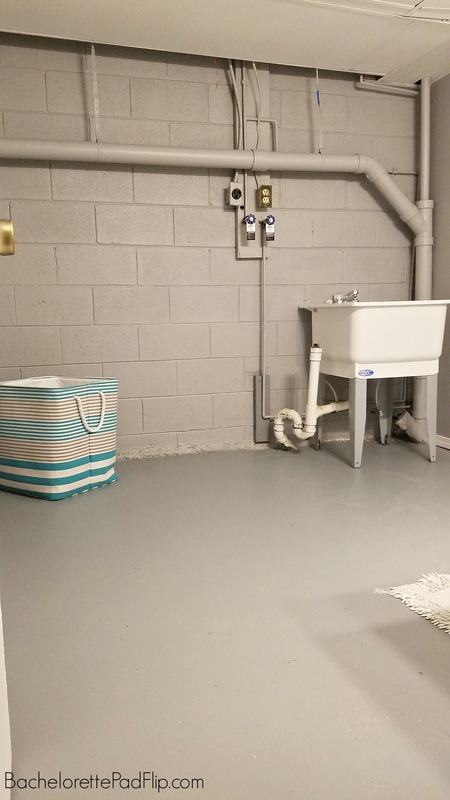 Since this bathroom is off the garage and game room, it will likely be used for football watch parties or when someone is working on a project in the garage, so we felt safe just painting the floors. We got a great deal on some porch paint at Lowe’s and gave the floor two coats. Because I know I’ll get asked, there wasn’t a name of the paint (and I forgot to take a picture of the can to remember the brand! )…but it was porch paint that comes in two different shades of gray. We chose the lighter shade. From there, I used some leftover paint from the Flip 3 living room. I found the vanity and mirror combo on clearance at Home Depot for $90…and on a whim, I asked if they’d take less since it was the last one— and they DID! So I scored the set for $80! On the laundry side of the room, I ditched the existing utility sink because it was beyond disgusting. I found a really affordable one at Home Depot for less than $30 and switched them out. The walls got fresh paint and the ceiling grid was painted white to help lighten the room and add the allusion to some ceiling height. Besides the electrical aspect, this room was pretty affordable. When we bought the house, this room was marketed as a half bath….but honestly? It should have been marketed as the potential for a half bath. There was no toilet or sink. In fact, during our initial showing of the property, we walked around trying to find the elusive half bath before we noticed the hook up in the floor in the laundry room. Ha! So we were literally starting from scratch on the half bathroom side. And since the room had so much stacked against it (views directly at the laundry, dungeon of a room with no natural light, immediately off the garage), I wanted to try to bring some sort of design to the space. 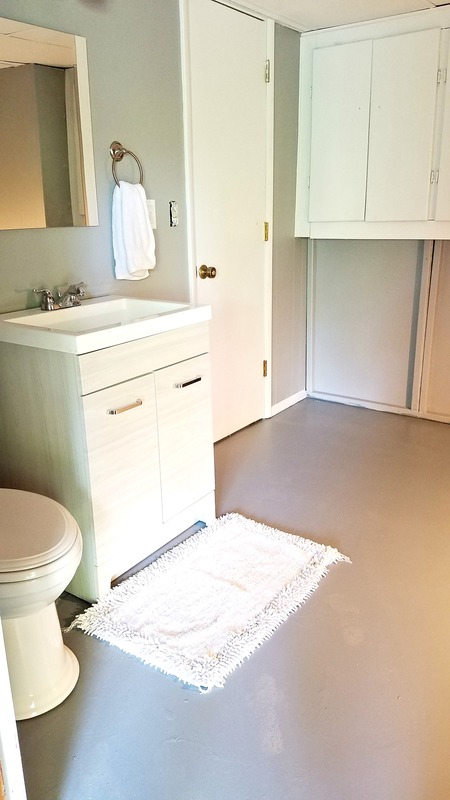 I assume this bathroom will get a lot of use when there are watch parties and game nights and movie days in the basement, so I wanted it to be presentable! Scoring the vanity on clearance tremendously helped. I love the clean lines and gray color scheme. For the toilet, I wanted one with clean lines similar to the vanity and one that was energy efficient because that’s always a selling point! For this project, I was fortunate enough to partner with American Standard. They have a variety of fixtures and toilets available, and I chose one that I thought was a good fit for the space and resale. I chose American Standard’s Esteem Vormax Right Height Elongated Toilet. I don’t know if you’ve ever shopped toilets before, but there are two non-negotiables for me: it can’t be a floor hugger and it can’t be round. This particular Esteem Vormax checked off my two requirements. From a resale and marketing standpoint, it also had several other features that home buyers LOVE! Probably the best feature of the toilet: CLEANS 2X BETTER than conventional toilets. So less cleaning…you better believe a home buyer loves to hear that! Rim design eliminates rim holes that catch grime and filth…so keeps your toilet CLEANER longer! The Esteem Vormax has EverClean surface that allows easy cleaning even after years of use! Warranty! A generous lifetime and 10 year warranty is another great selling point to home buyers! 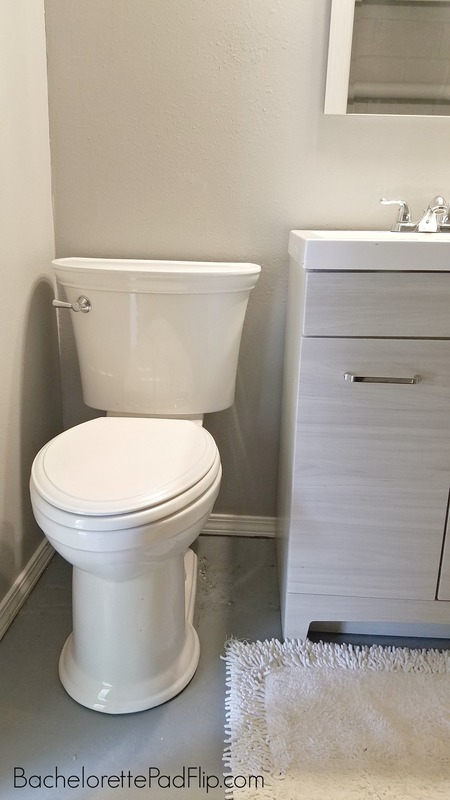 Adding the American Standard Esteem Vormax Right Height Elongated toilet and my Home Depot clearance vanity added tremendous value to the space! 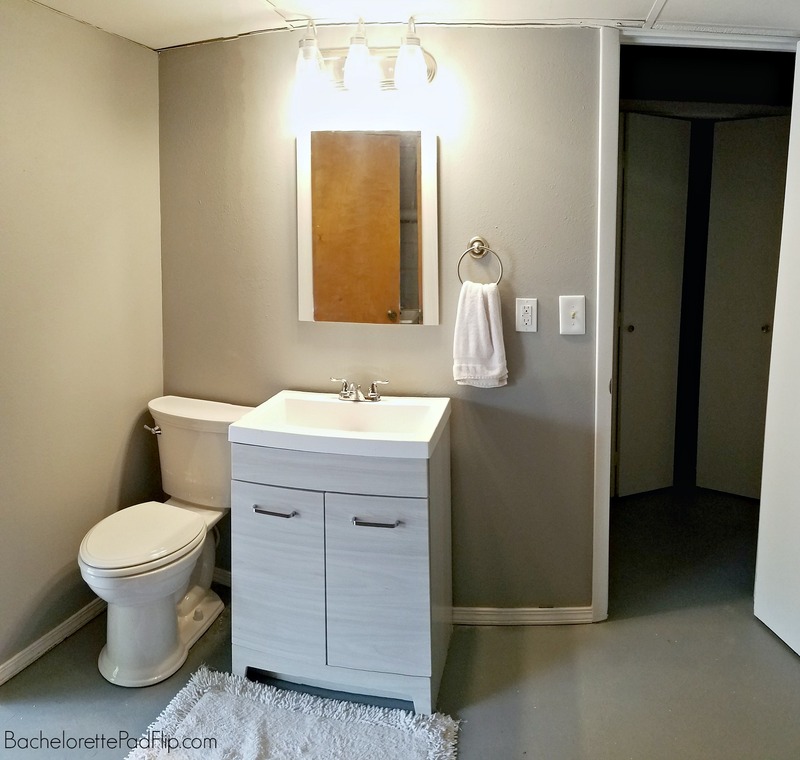 Now, instead of the potential for a half bath, I was able to market an actual half bath with clean design, high efficiency, and function! As with any product review or compensation I do, I do so because the product is worthy of my endorsement. I believe my readers would benefit from the product, so thank you for supporting the companies that support this blog! I’d forgotten how icky the basement area was. . . but wow – what a change ! It’s neutral, yet still bright, and that’s tough to accomplish in a basement/windowless area . . . good job ! There isn’t a door between the laundry and half bath part….just a larger open area.